Well, we returned from New England almost a month ago and I've finished RAGBRAI so it was time to see our travel agent to put together next year's international trip. We'd discussed a couple options. 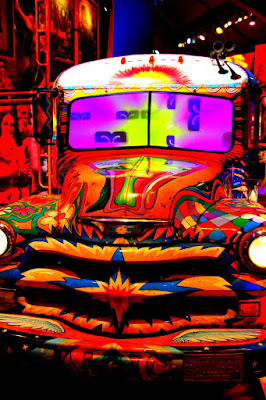 The first option was a return to South America where all our international vacations started back in 2006 (Peru). The second was Turkey, Israel, and Egypt. We dismissed this second one because of the political situation in the area. Instead we returned to our first choice. Quito, Ecuador and a small boat cruise through the Galapagos Islands. Santiago, Chile and Easter Island. Since we have a few extra days in our itinerary we will be spending a couple extra days in Santiago. Iguassu Falls (Brazil) and a short cruise down the Amazon River. A few days in Rio de Janeiro, Brazil. We'd hope to go to Rio after Easter Island and before Iguassu Falls but we couldn't make it work out so we moved it to the end and added the Santiago days instead. We'd hoped to add a few days in Havana, Cuba to the end of this vacation but things didn't work out for that either ... but ... we will be going to Havana in March of next year during the Wife's spring break. Nothing like two international vacations in the same year. At one time we thought the South America portion was going to be less than three weeks long and we sort of felt disappointed. It turns out it will be around twenty-six days which makes us feel much better. We've become such travel snobs. 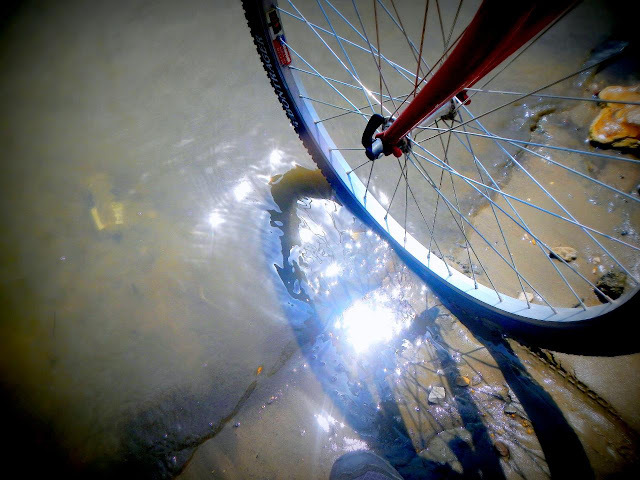 The end of my RAGBRAI ... dipping my front tire in the Mississippi River. Just over a week ago, as most of you know, I participated in the week long cycling regatta across Iowa known as RAGBRAI. It was a long week and it ended with many mixed feeling on my part about cycling, Iowa, and large groups of people. Note: I was going to include cool graphs and GPS based numbers in my post but operator error caused some problems during the first day's ride and an accidental reset wiped out numbers for the last day so I will not have any cool graphs and numbers. The Brother-in-Law (BiL) joined me on my RAGBRAI. His four time RAGBRAI rider experience helped me get my bearings (GOOD). The Niece (the BiL's eldest daughter) joined us for the first day. She was using it as training for a triathlon she will be doing in September. It was her longest bike ride and she did it with flying colors (GOOD). While the temperature and humidity were not as bad as the week before RAGBRAI (GOOD) it was still hot and humid enough to make things miserable when there wasn't shade (BAD). The wind was also cooperative either not blowing hard or blowing in a good direction (GOOD). The first stage was the longest and had the most elevation climb (BAD). It was the longest ride that I have ever done (and is still my personal best) and I think I tackled it well (GOOD). There are lots of opportunities to eat and drink along the way (GOOD) with a good variety of crappy food (GOOD and BAD) to eat to keep your body going. Unfortunately I ate too much crappy food selections along the way which, in turn, made me all bloated and crappy feeling on several of the stages (BAD). I ended up gaining a few pounds over the week despite the five thousand plus calories I burned each day (BAD). My energy level reflected my inconsistency in eating I think. Some days I felt good, others I had to dig deep to find the energy to pedal. The shortest day was probably my worst day (BAD). On the bright side I kept myself well hydrated (GOOD). On the dull side I drank enough Gatorade to float the Titanic and I'm not that fond of Gatorade ... especially now that I'm done (BAD). The campsites we stayed at offered only limited shade so, in the afternoon after ending the ride for the day, tents were put up in the sun and instantly turned into roaster ovens (BAD). Roaster oven tents meant no afternoon naps to help recover from the six to nine hours of bike riding (BAD). The crowd of bikes enter town. Since I was unable to nap during the afternoon, or find any comfortable and cool place to power down, I rarely partook of the evening entertainment. I experienced only thirty minutes of Huey Lewis and only twenty minutes of Cheap Trick. The other bands ... no minutes at all really (BAD). I probably should have done what other riders did in the afternoon and take naps along the route. Every farmyard with trees and every cemetery lined in trees looked like a bomb had gone off - there were riders laying down in every piece of shade. I did nap once in one town in the shade of a tree in a park (GOOD). The thirty minute nap didn't do much to revive me but the caffeine I drank afterwards did. Unfortunately I did not stop for naps more often (BAD). There were a few exceptions though. Fort Dodge and Eldora offered food in an air conditioned cafeteria (GOOD). Coralville offered movies in an air conditioned high school auditorium with real auditorium seating (GOOD), The most popular part of the high school building experience for many were the plug ins for charging their phones(GOOD but I also find this kind of BAD for some reason). Each day we were provided with shower service. Twice I used the services of shower trucks which were semi-private (GOOD). The other days where we showered in high schools or college facilities you showered while surround by a dozen naked old men (BAD). Each day I was exhausted, which was to be expected, but it was always hard to fall asleep since, after crawling in your tent, you sweat buckets for the first hour or so before it finally started to cool off. You would invariable wake up in the middle of the night cold requiring you to pull out the sleeping bag at 3:00AM (BAD). Talking drunk people or, as I noted in my notebook "Noisy God damned ... inconsiderate Asses" were a problem in Eldora including one drunk guy putting his tent up next to mine at 2:15AM. Fortunately for him he had his super powerful headlamp to light up the place (BAD). The riding experience was not quite what I expected. You were constantly amongst other riders. You had to be constantly aware of everyone around you to ensure your and other's safety. This meant the ride was not a relaxing coast across Iowa but an hours long exercise in concentration. This can be stressful (BAD). Fortunately I handled the bike traffic better than I expected having never experienced it before (GOOD). Crowded roads meant even more crowded towns. We had to dismount when going through towns, not because we wanted to, but because it was impossible to ride through the congestion of hundreds of bikers in search of food and drink (BAD). A jokester farmer leaving toilet paper next to his corn field ... at PP Avenue. Crowds also meant lines at the porta potties (BAD) resulting in many to use the convenience of the local corn fields (BAD). A considerable variety of bikes participated in RAGBRAI. You had your regular street bikes, various recumbents in various configurations, and more tandems (i.e. bicycles built for two) then I ever expected to see. Then there were the oddballs like the guy rollerblading, the unicycle, the homemade bamboo bike, and the elliptical bike. The variety gave you something to look at while you rode (GOOD). The variety of people also was staggering with the number of amputees being very inspirational including the one woman pedalling her bike with only one leg (GOOD). On the first day I saw so many flat tires that I knew it would be inevitable to have some type of breakdown along the way. On day two my chain got jammed and had to be replaced (BAD). Fortunately it failed in town where there were bike repair tents (GOOD). On day five my luck really ran out. First I woke up to a flat tire with a sheared off valve stem (BAD). It was the rear tire and I really wasn't sure how to do it with all the gears shifting stuff back there. There usually was a bike repair tent near the start of the stage so I started to walk. After an hour or so I gave up and turned my bike over to see if I could change the tube myself. Fortunately a member of the Air Force cycling team showed up (GOOD) and helped me replace the tire (they were doing it all along the route - really nice people). I ride a hybrid bike with larger tires. When the Air Force guy pumped up the tire he didn't take that into account. See, my tires should be around 75 psi. Road bikes, like he was used to, are usually in the 100 to 130 psi range. I thanked him, he left, and I got on my fixed bike. A few feet into the ride I heard a rubbing noise. I figured it would wait until I found the bike repair people. Well, about 200 to 500 feet later there was a big BANG! A hole blew in the tube. This resulted in a hole being blown in the tire (BAD). I sighed, laughed a little, and continued to walk my bike. I found the bike repair tent about 2.8 miles (4.5 km) from the starting point for the day. Later in the day as I approached a slower bike I squeezed on the brake and heard a "TING!" and there was no brake (BAD). I pulled off to the side of the road without any major issues. Fortunately the brake cable had not broken and had simply slipped out of the mechanism. I was able to repair it in a few minutes. This would also be my last major issue with my bike (GOOD). I didn't suffer any accidents, coming close only once that I recall when I took a turn to sharp and dropped my tire off the pavement. I recovered but it woke me up (GOOD). I saw either accidents or the aftermath of accidents along the entire way. Ambulance sirens were heard at least once a day (BAD). The scenery along the way was fields of corn and soybeans as far as the eye could see. It was both beautiful (GOOD) and monotonous (BAD) at the same time. The fields were broken up by farm houses which often had a food or drink stand close by. The entire route, but especially days one and six, reminded everyone that Iowa is not a flat state. The hills, especially those right before Coralville, were killers (BAD). I ended up walking two hills on the way into Coralville and I can blame only one of those on extenuating circumstances (I was behind a truck and a bike ahead of the truck threw a chain forcing the truck to stop and me to lose all my momentum.). Fortunately those were the only hills I had to walk (GOOD). 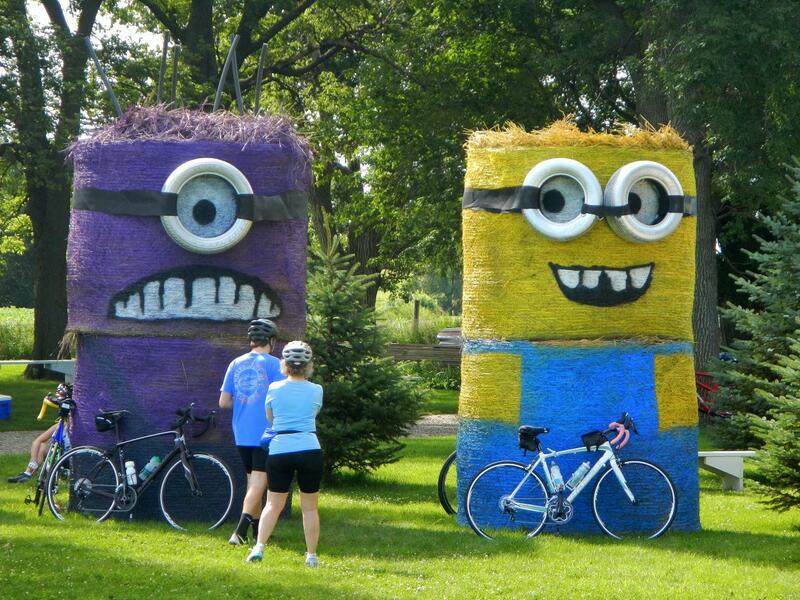 Some fun along the route - Hay Bale Minions. Along the RAGBRAI route there is always an optional loop that would allow you to ride a century (i.e. 100 miles). I chose not to take the optional loop (GOOD). Besides the heat and humidity, we had rain. There were only two days of rain. The first on day two was minor and didn't last long (GOOD). 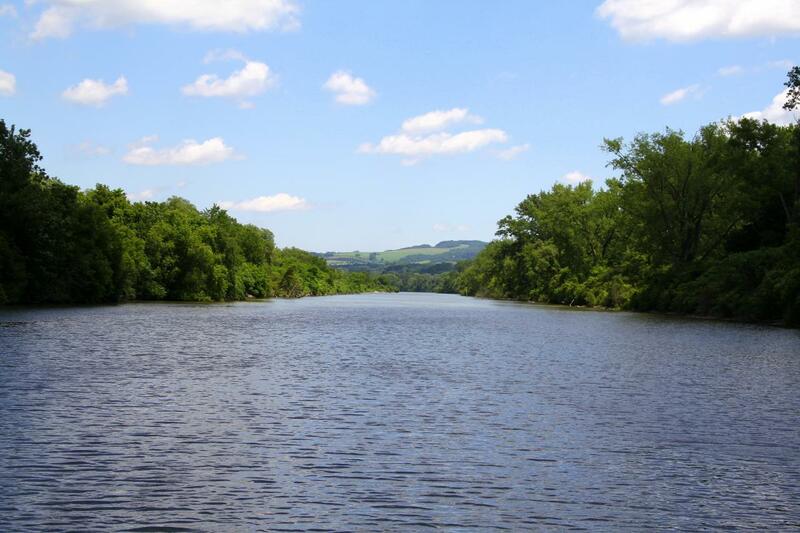 The second on day six going into Coralville was a deluge. I was totally soaked through and, due to hazardous road conditions, we had to take the downhills slow which made going up the other side of the hill that much more difficult (BAD). My bike headlamp flew off on a hill going into Coralville. I did not stop in the rain to retrieve it (BAD). Speaking of lost things, I left my good sunglasses on the grass in Eldora. I'm sure some high school kid who volunteered to clean up after us is enjoying my $180.00 sunglasses - I wasn't going to use them on the ride but forgot to take them off after the Wife dropped us off at the starting point. My bad (BAD). My cheap sunglasses that I'd meant to wear on the ride ended up getting scratched to the point of being useless. I wasn't easy on my sunglasses (BAD). So, what is my overall opinion of my RAGBRAI experience? After my first Camino I felt my adventure was incomplete and I needed to do it again. After my first RAGBRAI I can say with certainty that I am not fond of cycling. The bike will soon be moving to the basement where it will most likely become a permanent trainer. Training for RAGBRAI has improved my annual blood test numbers so I will try to keep it up ... in the basement ... with Netflix. Will I ever ride RAGBRAI again? No. I have no need for another RAGBRAI. I have never felt that exhausted for so long. Each day I was weary. Before I started I expected to feel a sense of satisfaction each day upon arriving at the end town. In fact I didn't feel satisfaction, I felt relief. Relief of it finally being over. The relief didn't last long as the lack of even basic comfort at the end of the day sucked the fun right out of it for me. I didn't like the crowds. It was hard to make friends when they would be lost in the crowd the next day. I rarely ran into the same people twice. Having said this, a lot of people seemed to be having fun. Maybe it was all the beer vendors along the route. Or, maybe, it was just me. I'm not happy when everyone around me is having fun while I'm not. 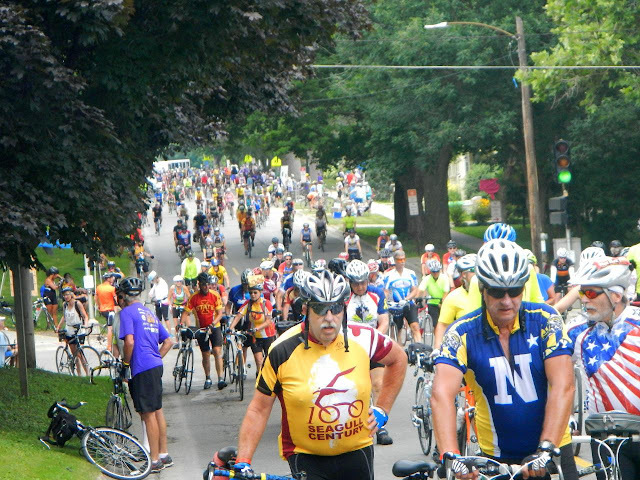 There is one situation that would make me reconsider riding RAGBRAI again. My Camino friend KSam has said that RAGBRAI was on her bucket list. If she chose to do it I would consider doing it with her but ... I suspect my reconsideration would still be no. I would support her and take her and her bike to the start and pick her and bike up at the end. But riding with her ... we'll have to see if it's true that time heals all wounds. I took few pictures ... too dang tired to take out the camera ... but I have posted a few in my 2015-07 RAGBRAI Google Photos album. The nineteenth book of the year for me was Emily St. John Mandel's "Station Eleven ". This was a delightful book and I'm really not sure why. The book is a post-apocalyptic story about the north eastern United States and Canada after a virulent flu wipes out the world population. In a matter of a few months all civilization is ruined. No more electricity. No running water. No fuel for vehicles. All after a flu with a 99% lethality rate sweeps around the globe. The story bounces from present day (i.e. 15 years after the devastation) to just a week or so before the flu strikes. 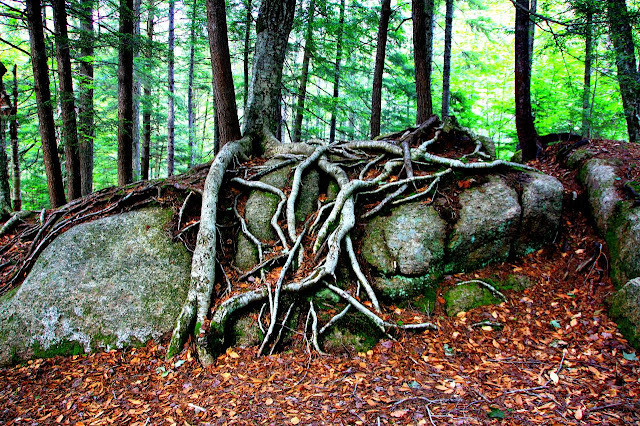 The characters lives are interwoven in a complex and interesting way. In the end, almost everyone we have followed closely in the pages of this book are connected to a famous actor and a graphic novel illustrated and written by one of his ex-wives.. I liked this book a lot. I'm not sure why since the action is rather muted but this is appropriate in a world where nearly everyone is gone and you can go for days without seeing other living people. I was sorry to see the book end and I wonder what will happen next. I gave this book five stars of Goodreads. Sometime simplicity and understatedness is just what I need from a good story. The eighteenth book I've read this year was David Mitchell's "The Bone Clocks ". This was an interesting book about two factions of immortals - hereditary and acquired - who are waging a slow motion war through the decades. The book follows a young teenage girl who involuntarily plays an important role in the war. The timeline of the book jumps ahead years or decades ahead introducing new characters but inevitable connecting them with our protagonist who grows up as the book progresses. The end ties all the ends together nicely. In general I liked this book. I wasn't as keen on the 'world' Mitchell created in the book. Nothing specific, I just didn't get into it as much as I would have liked. Even with my lackluster opinion of the book's 'world', I still gave the book four stars on Goodreads. It was entertaining, it just could have been better. 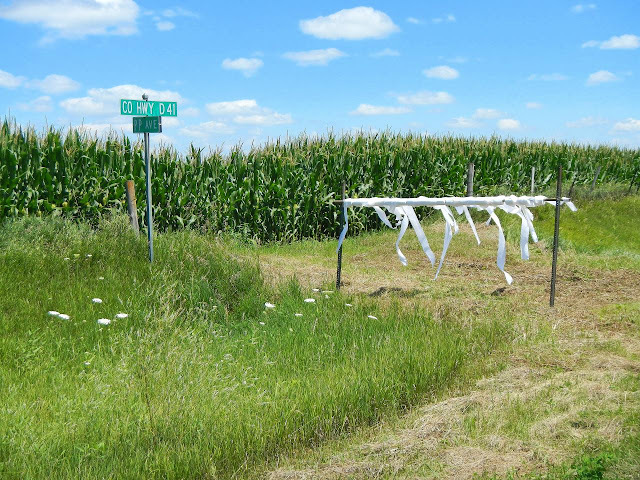 Note: I composed this post before I left on RAGBRAI. I want to thank my Mom for the nice card, gift, and the dozen ice cream sandwiches she left me Friday. A half dozen were gone by the end of the day and a few more were consumed before we left for Sioux City. They were awesome. 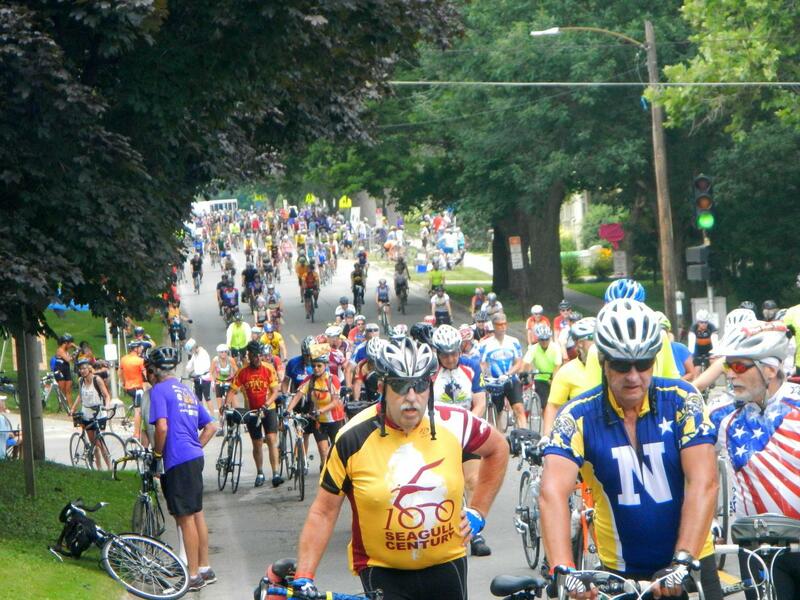 Note: I composed this post before I started RAGBRAI. 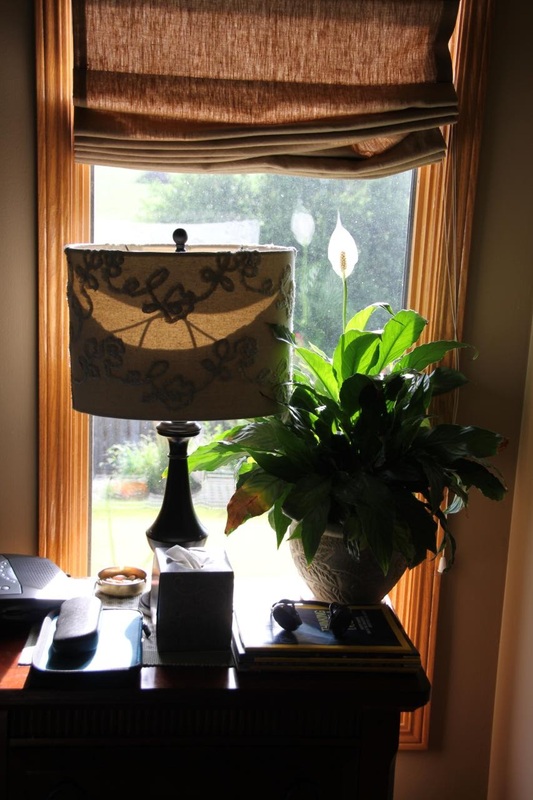 I saw a smile this morning from my bedside lamp. The Wife says it's a good omen for my RAGBRAI. I'll let you all know how it goes in a week or so. I finished my RAGBRAI training yesterday. I was going to finish it today but I used the weather as an excuse not to. The forecast turned out to be mostly wrong so I could have squeezed in one more training ride but, really, would one more ride really make a difference at this point? I hope the answer is not much at all. My training regime, as it were, was a struggle between dedication, procrastination, denial, and urgency. I know I didn't live up to the plans I had at the first of the year. I take solace in the fact that I didn't train as hard as I wanted before my first Camino either and I did just fine. Ready or not, I will be riding RAGBRAI next week. On Saturday the Wife will take me, the Brother-in-Law, our bikes, and our bags to Sioux City, IA. On Sunday we dip our rear tires in the Missouri River and start pedaling west. Seven days later we reach Davenport, IA and we dip our front tires in the Mississippi River and our RAGBRAI will be officially done. In between the tire dips will be a lot of sweat, sore muscles, camaraderie, good food, and good times. At least that's what I hope happens. RAGBRAI will be one of the toughest challenges I have ever subjected myself to. It tops walking 616 miles on the Camino I think. Physically I think I can do it. It will be tough and my body will be challenged but my mind will probably be tested the most. I will find out just how much I can endure. I will try my best to not give up. I will try my best to finish the regatta, I will try my best to push through the pain ... and I will try my best to endure the mental anguish that I know I will subject myself to all along the way. To my Brother-in-Law I promise to try my best not to let my mental anguish show - no one likes a complainer. Tomorrow is the next big space encounter of the year (the first being the dwarf planet Ceres mentioned here). This time it will be a fast flyby of the dwarf planet Pluto. I know there is a lot of arguing going on about is Pluto a planet or a dwarf planet. I will not participate and simply accept the official designation. 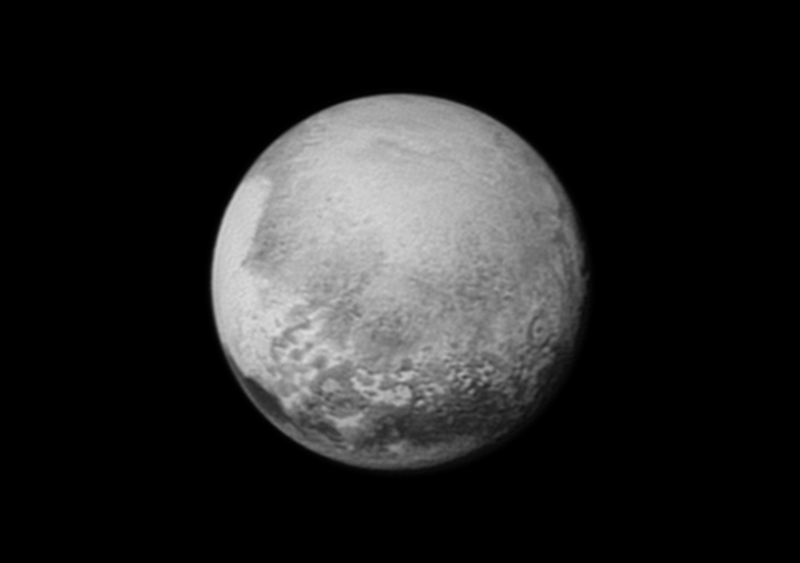 If you want to follow the action, here's a link to the NASA/JHUAPL New Horizons site. The closest approach will be 7:49AM ET Tuesday. I'd watch live but I will likely be on my bike. The heavens are often secondary to the more mundane earthly requirements. The view from Melville's Arrowhead including an interesting sculpture. On day ten we continued our literary tour first by visiting Arrowhead, home to Herman Melville (literary site number nine) followed by Edith Wharton's "The Mount" (literary site number ten). Both houses are photogenic but they occupy the extremes of the spectrum. Arrowhead feels like, what we would call, a middle class home. The Mount, on the other hand is large, imposing, filled with luxury. I especially liked the Mount's gardens. While both homes are very photogenic, only the larger, glitzier Mount allows photography within the house. 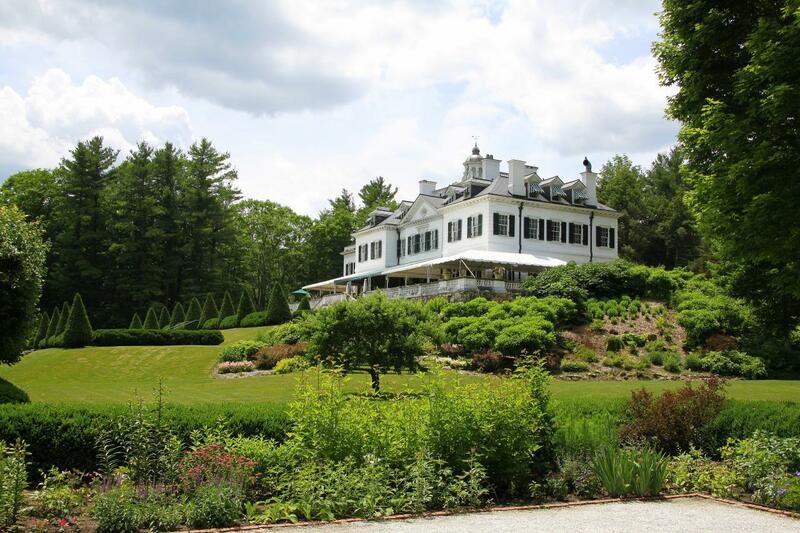 Edith Wharton's country home and gardens. Early afternoon, after eating lunch at the Mount's cafe, we headed for Springfield, MA. Along the way we passed under a bridge labelled Appalachian Trail - my last encounter until 2017 I expect. In Springfield we followed the directions to Henry's jewelry store. In the back of the store is a museum dedicated to the Titanic. Naturally, based solely on its location, you can deduce that it would be quirky and you would be right. The museum was filled with memorabilia related to the Titanic, its sister ships, the rescue ships, and, of course, the movie. After leaving the museum we tried to figure out how to get to our hotel. We ended up stopping and asking a couple of guys. They talked between themselves, started giving rather convoluted directions mixed with several side stories along the way. Within thirty seconds I was totally confused. Fortunately one of the guys realized how messy the directions had become and said "follow me." He got into his car and we followed him across town until we saw the exit we'd been looking for. Sadly he didn't take our exit so we never adequately thanked him for his help. Springfield is also the home of Dr. Seuss. 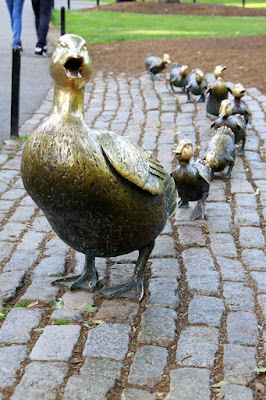 After checking into the hotel we got directions to a sculpture garden dedicated to the children's author (literary site number eleven - this one my idea). A few wrong turns later and we arrived. 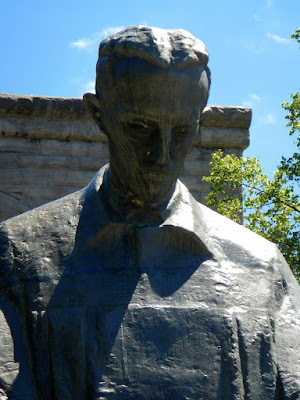 There are five statues depicting the author and his beloved characters. 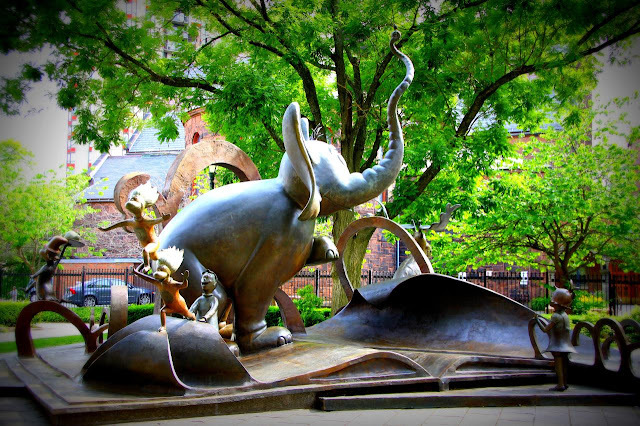 The largest sculpture with Horton, Thing 1 and Thing 2, and several other characters all standing on a giant book just begs to be climbed on. Unfortunately the statue is surrounded by signs says "Do not climb on sculpture". Sad that such a climbable sculpture does not allow climbing. It looks so kid friendly but kids are kept away - very un-Seuss like. 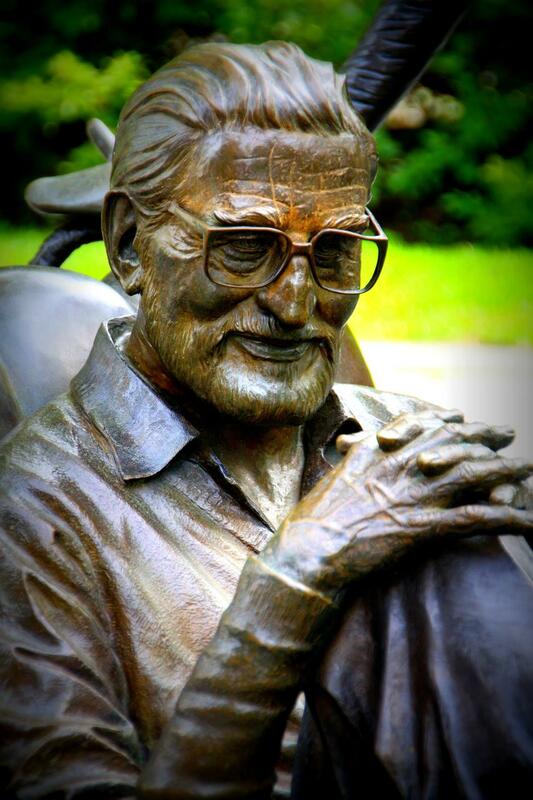 A statue dedicated to a man who wrote delightful stories for children should allow children to climb on it. ... but it is not allowed. Plans for day eleven ended up changing quite a bit. 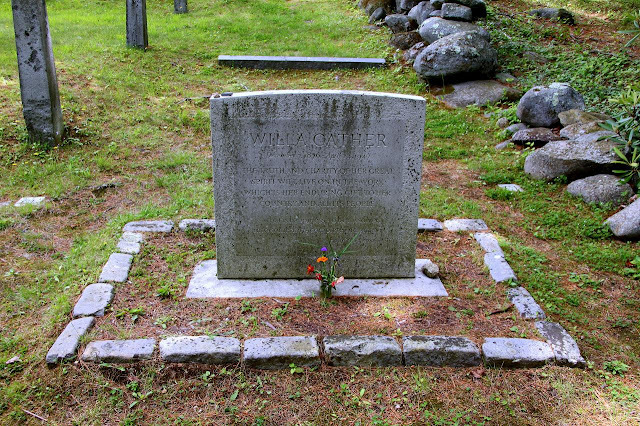 Originally we were going to Mystic Seaport. Along with a whaling ship we would have visited the severed arm of a saint and a park bench dedicated to Ruth Buzzy. At this point in our vacation these things didn't excite us. The cost to see some of this stuff seemed a bit high too. The night before we decided to change plans and head back to Lowell to explore the canals and the mills. 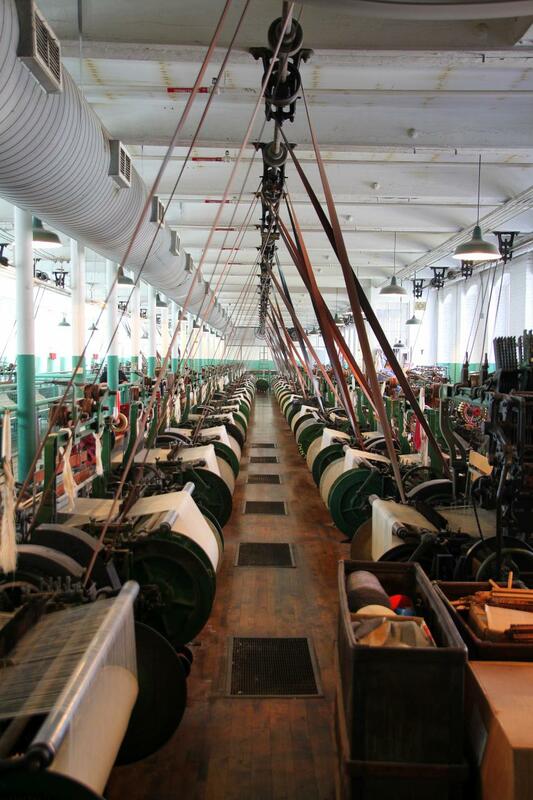 The mills - still run today by the National Park Service. We arrived at the National Park visitor's center to find that the noon Canal cruise we wanted was full so we picked a 2:00PM one instead and dumped our planned 2:30 PM trolley tour. It worked out well since we had time to learn about the Mill Girls, immigrants, and Cotton Mills before our canal cruise. The history was interesting and the weather was perfect. Throughout this day I ate way way too much. Chicken Parm Sandwich for lunch (marinara sauce does stuff to my stomach). Pulled pork mac & cheese drizzled in BBQ sauce for dinner (BBQ sauce does other stuff with my stomach). I topped it off with a piece of Cookies & Cream cake (Sweet, non-dairy, things also do stuff with my stomach). Any one of these things would have been fine but, by eating all three on the same day, in the middle of the night I woke up feeling like a bloated whale carcass which is appropriate since we would be going to the whaling museum tomorrow. It's been awhile since I had bloated heartburn this bad. Day twelve would be our last sightseeing day and we had a few things left on our agenda. 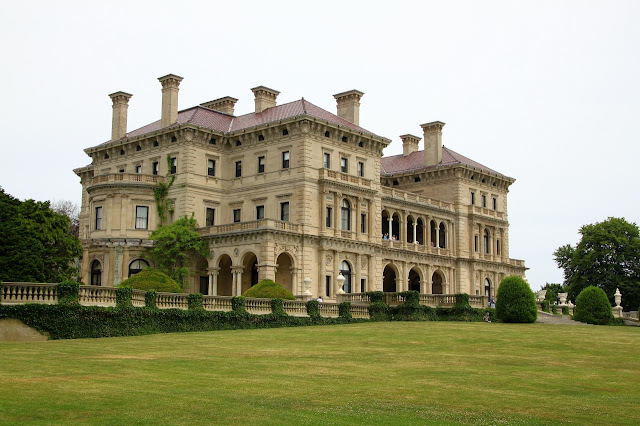 First on that agenda was in Newport RI: The Breakers - the Vanderbilt 'cottage'. The Vanderbilt's 'cottage': The Breakers. We took a nice audio tour of the 1% opulance. We arrived just behind a bus full of French tourists who started out moving too slow when they got to doorways. I squeeze through mumbling "Pardon". Once the crowd realized they were blocking the way things went faster for everyone. 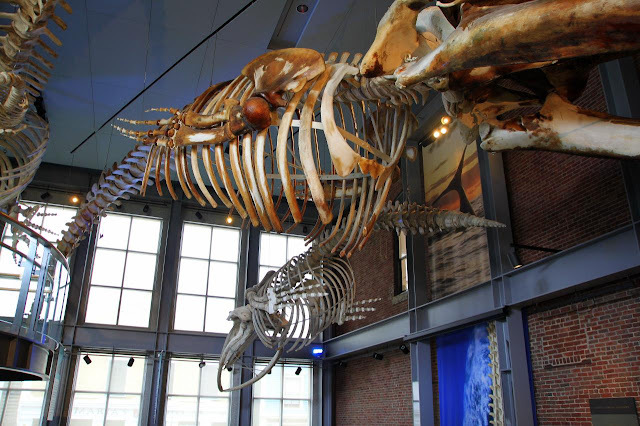 The second stop for the day was the New Bedford Whaling museum. We went through it pretty fast as we usually do. It was interesting but not 'wow'. Finally we drove out on Cape Cod ending up in Provincetown. This had been my idea - one last attempt for a scenic drive. Turned out not to be that scenic either. 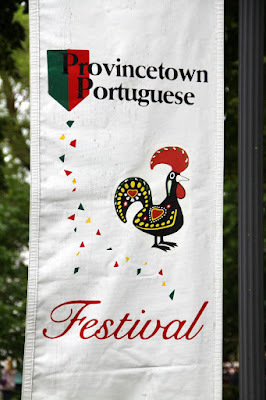 The saving grace was the Portuguese Heritage parade we ran into in Provincetown and the ice cream parlor just off the main street where the parade went down. I bought a second t-shirt in Provincetown - who can resist t-shirts for only $6.00?!? We drove back to the mainland and found our hotel. We tend to chose inexpensive hotels. This one, the Capri motel, was special. Behind the front desk prominently displayed for sale were candy, cigarettes, cigarette lighters, and condoms. Not a good sign. Our room key wouldn't work. There was only one lamp. There was only one towel. There was a headache inducing smell. We could have survived all this except the WiFi was crap. We asked for our money back and, to their credit, they didn't argue about it and were nice about it. The Best Western next door was full so we used their free WiFi to locate a better hotel that took us forty-five minutes closer to Boston, was cleaner, smelled fine, and had good WiFi. This was our one and only bad hotel experience which ain't bad - a 91% hotel picking success rate for the Wife! The next two days were transit days. Day thirteen started off raining ... no ... pouring and windy. We drove back to Boston in the pouring rain and returned our rental car. Fortunately you could get from the rental car place to the train station without going out in the rain. An hour or two at the station and we boarded our train south to Newark airport where the hotel shuttle picked us up. Day fourteen was our only early starter so we could get to the airport for our flight home. Things went rather smoothly and we were home by 9:30AM. So that covers our latest domestic vacation. This trip was a bit lackluster. 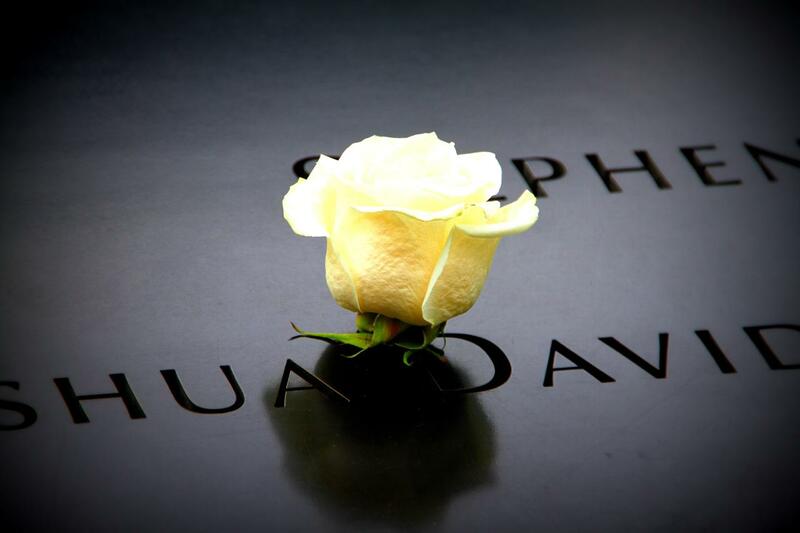 I liked New York, the 911 memorial, and the Freedom Tower. I kind of liked Niagara Falls. 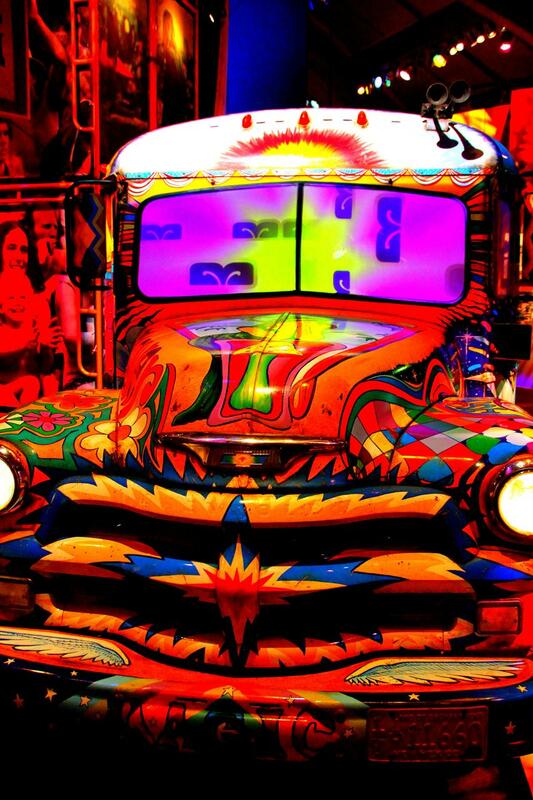 I liked Woodstock. They were all 'likes' not 'loves' and I don't remember any 'WOW' moments. The desserts, and I had many, were good though. We've been alternating between domestic and international travel. That may be at an end. We are running out of domestic destinations that we are interested in and we both agree that this one didn't live up to our last domestic vacation in New Orleans. In two years when we would have done another domestic vacation I will hopefully be hiking the Appalachian Trail so I don't know when we'll take another domestic vacation. Next year ... we go international once more. A few weeks ago I hinted that I was getting back to my routine after being on vacation for a couple of weeks. That isn't really true. I have been out of my routine for a few months now. RAGBRAI training has bitten three to four hour chunks every few days since early spring. With the arrival of summer, a season I regard as the great routine killer, vacations, family reunions, school breaks, and other activities associated with June, July, and August leave the shredded remains of routine strewn around in their wake. With the quickening approach of RAGBRAI and my RMNP camping trip soon after, the few remaining fragments of my routine have been thoroughly ground into dust. I am a man who likes his routine. I gain comfort from the well worn schedule. This summer (and a bit of the spring thanks to RAGBRAI) has been a bit discomforting to me. I think that is what has been driving my funk for the last few months. Despite these minor differences, I've managed to put together a reasonable facsimile of my normal routine and, while it hasn't done anything to get me ready for RAGBRAI or my camping trip, I think it's done wonders for my sanity. A week into our vacation and we, again, had a relaxingly slow start to the day but it would end with a running out of patience and a change of route. We left the hotel at checkout time and stopped at a Denny's for a late breakfast/brunch. We'd booked an Erie Canal cruise for 3:00PM but I was able to change it to an earlier 1:00PM cruise instead. 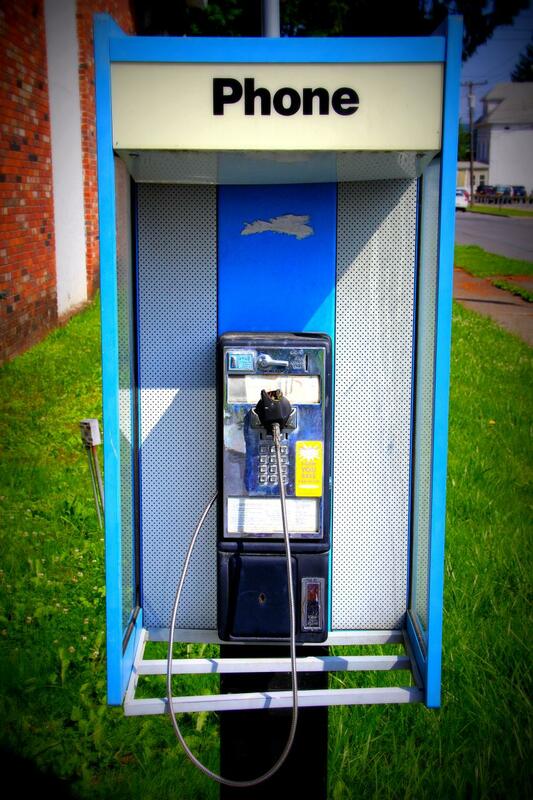 This was a good thing since there wasn't much in or near Herkimer, NY that interested us. We crossed the road to the Erie Canal Cruise office to board our small cruise boat. The weather was perfect - sunny with a light breeze. The captain talked about the history of the Erie Canal and cracked terribly lame jokes as we cruised down the canal and went through one of the original locks. I learned a lot of interesting boating facts including the circumnavigation loop ("The Great Loop") that takes seven to nine months. Many start it but many fail to complete it. Kind of like through hiking the Appalachian Trail. We passed a couple of boats flying the Great Loop flag during our cruise. I'd be tempted but that would require the purchase of a boat. After the cruise we headed west. I wanted to take a route along the coast of Lake Ontario. The AAA map we had marked the route as scenic and I hoped to see grand vistas of the lake as we headed West. We made our way to the coast and started driving west 'along the coast'. Turns out the scenic route doesn't stay close enough for you to actually see the lake. It wasn't very scenic at all. It was also veeeeerrryyyy slow. About a third of the way to our destination, Niagara Falls, we gave up and changed our route to something faster and frankly just as scenic, or non-scenic, as before. We were both ready to get out of the car at the end of this day. The next day, day eight, we had another very lazy morning sleeping in before heading out for lunch. At 1:00 pm we were picked up by our tour bus at our hotel by driver/guide Bob. Bob was a character. Sort of an encyclopedia with ADHD. He was full of facts ... Some relevant and some not ... and he even managed to finish a story or two during the tour before being sidetracked with another story. The tour started late due to the time it took to pick up everyone (which included visiting the same gift shop three times to pick up three different people) but in the end we had our full five hour tour. Near the Cave of the Winds - The American side of Niagara Falls. The tour took us around different parts of the up and down river from the falls and took us to the American side of the falls. The view from the Canadian side is supposed to be more spectacular but we didn't have our passports, or the time, to check it out. At the cave of the winds we took an elevator down, put on our free yellow ponchos and sandals, and walked into the mists of Niagara Falls. Despite their best efforts, the ponchos could not compete with the roaring falls - We got soaked. 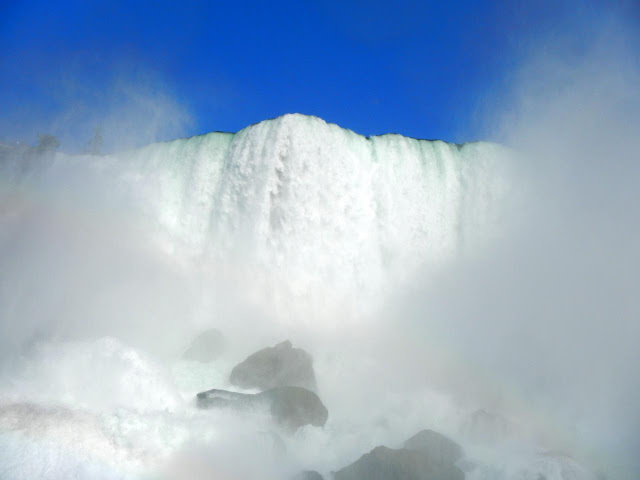 The roaring waters of Niagara Falls from our boat, the Maid of the Mists. 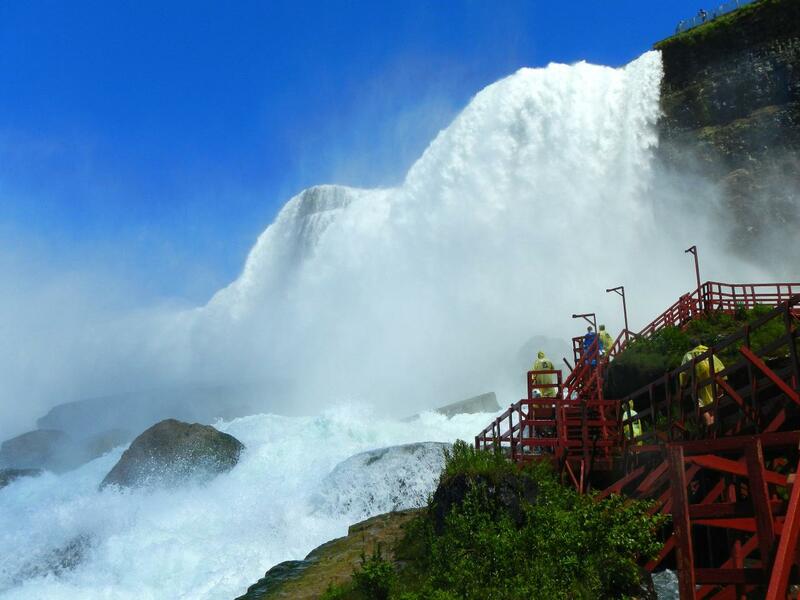 Next we took a short ride on the Maid of the Mist tour boat who gave us views of both parts of the falls close up. Again, despite wearing a free blue poncho this time, we really got wet but it didn't matter as the view was spectacular. After the tour we were pretty whipped so it was back to the hotel for dinner, some laundry, and being lazy. The parting shot of the falls before we left for the hotel. 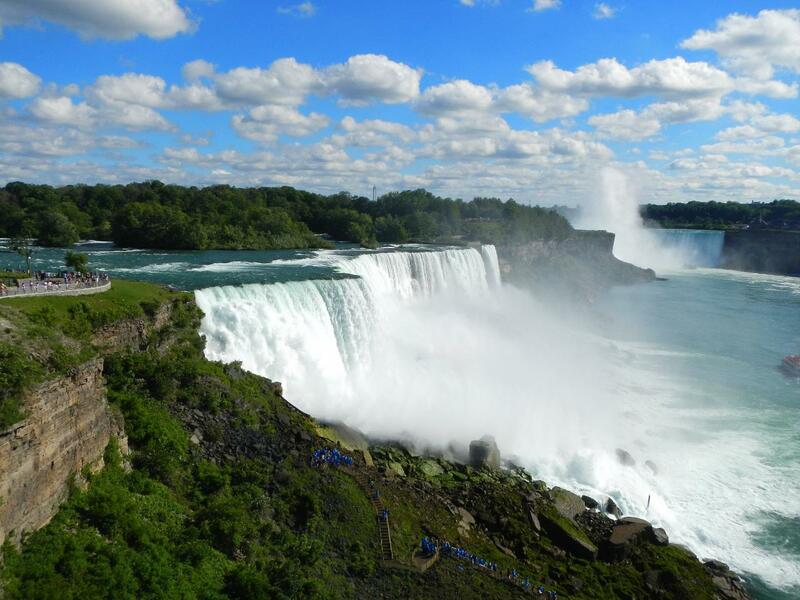 While I enjoyed Niagara Falls - it was one of the high points of the vacation - I have to say it is the first place I've visited where it didn't totally meet or exceed my expectations. I always imagined it to be bigger, taller, and more imposing. I wonder if this is more evidence that I (we) are becoming travel snobs. The Woodstock logo on the memorial plaque. After more driving we ended the day in Lenox, MA. It felt like too much driving today. Tomorrow we return to our literature tour when we visit two historic authors' houses before we head for the Titanic museum. Photographs have been added to the end on my 2015-06 New York, Boston,New England Google Photos album. We slept in very late the morning of day four recovering from the last two challenging days. We checked out of the hotel, walked past the meth/crack smokers in the parking structure, and arrived at the rental car place. They gave us a Kia Soul which felt huge and they consider a subcompact - lime green so we wouldn't lose it in a parking lot. 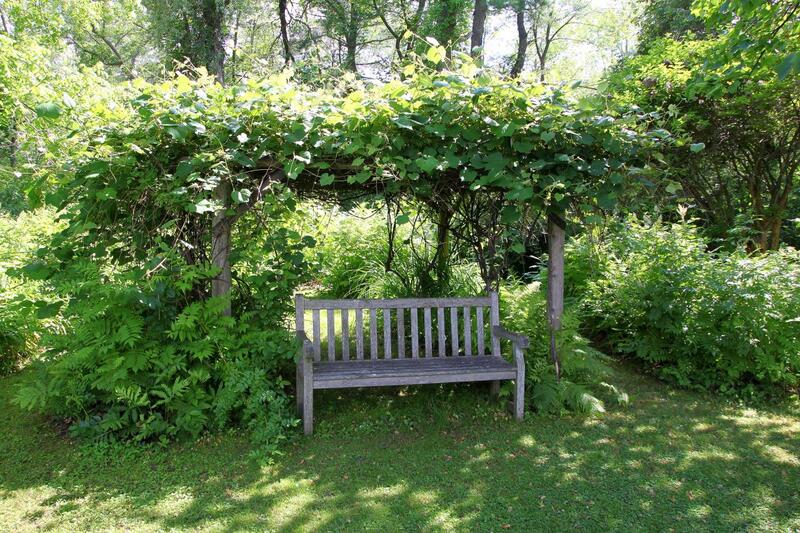 A grape arbor built by Henry David Thoreau for Ralph Waldo Emerson. On the way out of town we visited Walden Pond made famous by Thoreau (literary site number five). 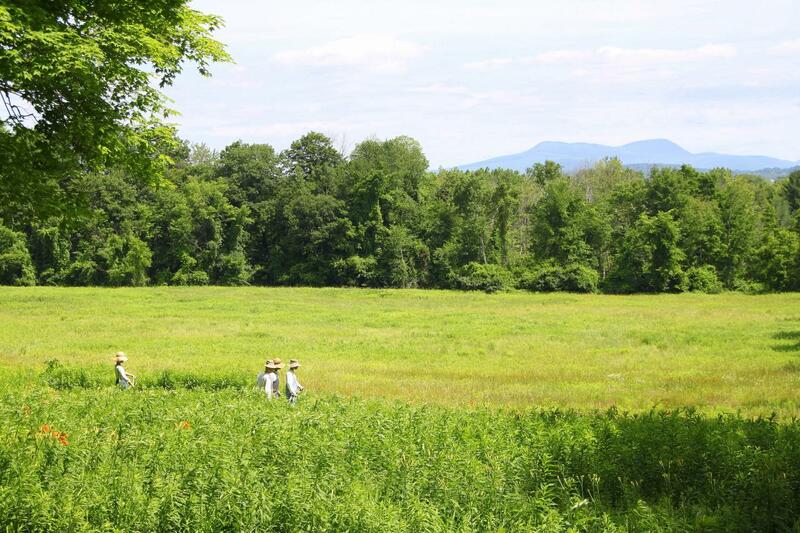 Here we saw a reconstructed cabin in a place where the original Thoreau cabin never stood. We had a rough time finding magnets in Concord. Very few souvenir shops - ie. none. We did manage to find a few and we bought some pins that could be made into magnets. We ended our day near Lowell, MA. Took us a while to find a hotel. It took a stop at a restaurant with WiFi for us to finally find it. In the end it turned out to be conveniently located to our next destination - Kerouac's tomb and memorial. Next we drove through the countryside on our way to Jaffrey, NH. The drive was delightful with the road lined with thick forests but, after a while, the road started to feel a bit claustrophobic. Not sure how I would handle it if I lived here. There were also a shortage of street signs that made it hard to confirm where you were. I resorted to looking at people's mailboxes ... thank you to people who put their complete address on their mailboxes. The grave of a Nebraska native - Willa Cather. 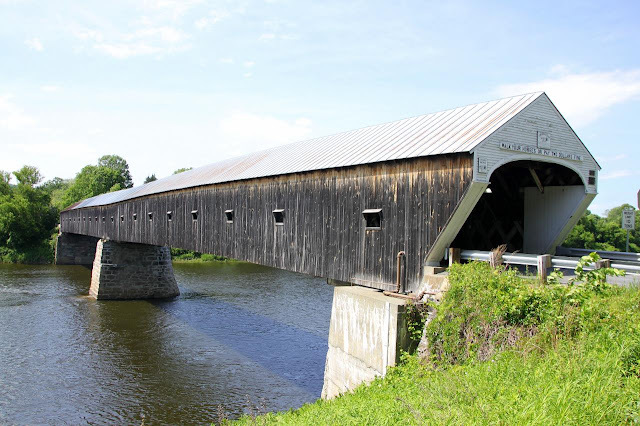 covered bridge in the world built in 1866 for $9,000. We crossed the bridge twice before we left Winsor and headed to Franconia Notch. We arrived late at our hotel right outside the park. I talked with the owner of the hotel and he confirmed that rain would be moving in over night. This changed my plans a bit since most of my planned activities here were either outside or required good visibility. While the wife rested in the hotel I drove to the visitor center and did the first of my activities: hike the Flume Gorge trail. The hike is interesting but short being only 2 miles. The hike is along a river and several cataracts so the sound of falling water is never far away. 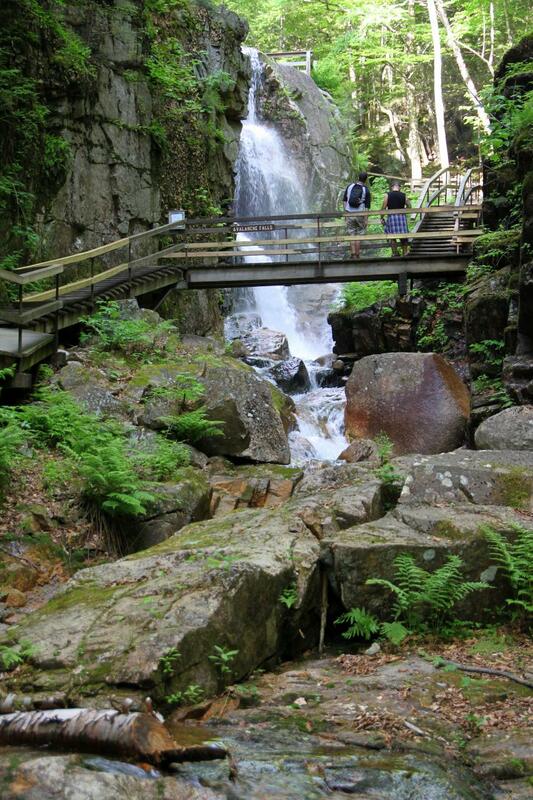 The first half climbs a bit and involves wooden steps along the gorge and rushing water. Nothing more relaxing than the sound of water in nature. Sadly, the GPS that I had packed was forgotten back as the hotel so I don't have elevation and distance numbers. The good thing is all the biking I've been doing served me well here. By the time I got to the top of the Flume Gorge I was sweating profusely like I usually do but I was not nearly as winded as I usually feel. This bodes well for my Rocky Mountain National Park trip in August. We ended the day with a very good dinner. We were going to walk the downtown but just about every place was already closed ( on a Saturday night!!! ). The towns of Lincoln and Woodstock were full of bikers with a biker rally taking place not far away. We woke up on day six to rain, the leftovers from Tropical Storm Bill. We stopped at the Franconia Notch visitors center and bought magnets and snacks. The second activity I'd hoped to do was take the tram up to Cannon Mountain. The first tram in the United States had been located here. The rain and the low clouds put the kibosh with that plan. Taking the tram today would have been a trip to the inside of a cloud and the insides of clouds are kinds of boring. We left through the north end of the park passing a trailhead for the Appalachian Trail (AT) along the way. The last thing I'd wanted to do is walk a little on the AT. It would not be. It will just have to wait til I walk there from Georgia. 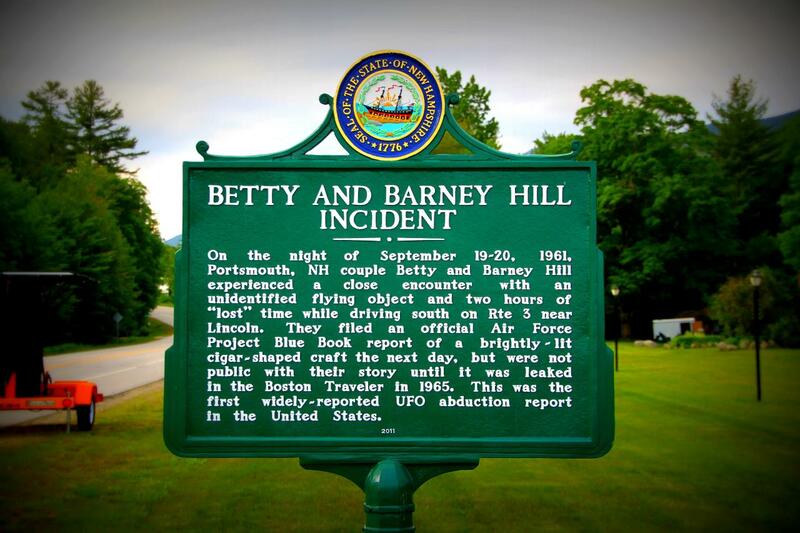 A famous UFO abduction took place near Lincoln, NH. I read a lot about it when I was a gullible kid. Leaving the north end of the park we turned west. A nice, but wet, drive through New Hampshire and Vermont. 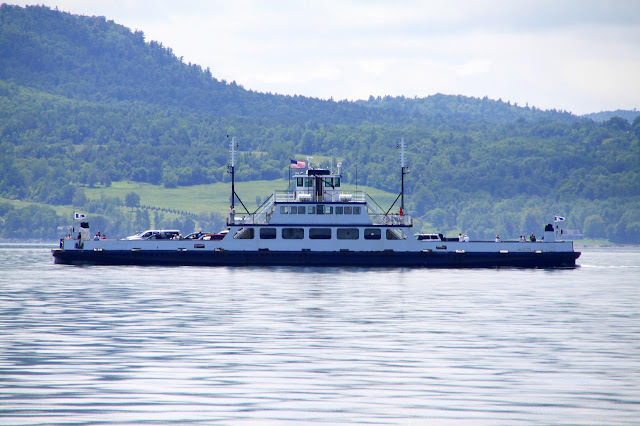 We took a short ferry ride across lake Champlain to the New York side. As we waited for the ferry the sun came out and it became quite warm. We rode a ferry similar to this one across Lake Champlain. We entered the Adirondacks in a mix of sun and heavy rain. We stopped for a nice lunch near Keene, NY. We turned south (only a hundred miles from where those escaped convicts were still on the loose) and drove the length of the Adirondacks passing small towns hidden amongst the trees and along the shore of tranquil lakes. I enjoyed the scenery along this drive. I itched each time we drove past a trailhead sign. We ended the day in a rundown place in Herkimer, NY with crappy WiFi. 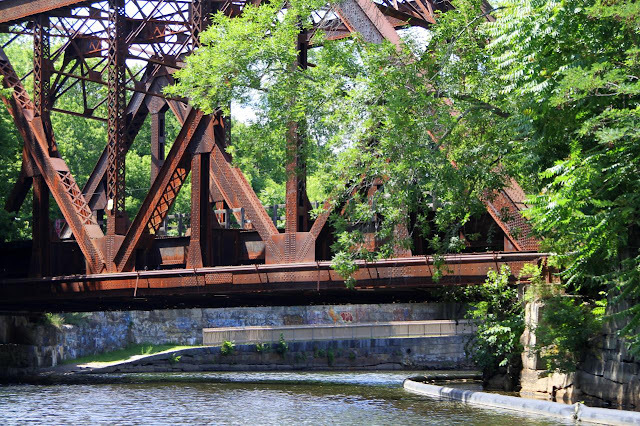 Tomorrow we would take a cruise on the Erie canal before driving to Niagara Falls. Pictures can be found in my 2015-06 New York, Boston, New England Google Photos album. Well, my post on Monday said I was going to ride my bike every day this week. I rode Monday and Tuesday but I wimped out on Wednesday when I woke up with screaming thighs. Thursday was rained out but I did get out today. Since I'd missed two training days for one reason or another I decided to push myself a bit. I was aiming for 52 miles but, during the ride, I changed my target and went for 56 miles (90 km). After four and a half hours (that includes rest stops ... lots of rest stops) I returned to the car and checked my GPS: 55.96 miles. Seeing this I said "heck no", got back on the bike, and rode another 1,100 feet so I would have 56.17 miles on the GPS. 56 miles happens to be the length of the shortest RAGBRAI leg. Yay for me. I fully expect not to be able to get out of bed tomorrow morning ... but I will as we are going to the In-Laws lake house for the Fourth of July. Happy early Fourth of July everybody! Of all our vacations, I think this was the most unplanned. Yes we had a list of places to visit. Most of these were the Wife's because, after I went through the AAA books and stuff, I had difficulty coming up with a list of places I wanted to visit. In the end we ended up with a combination of literary visits primarily for the Wife, several non-literary places for both of us, and one state park that I was interested in along with a few nice drives I wanted to do between stops. Day one was a travel day. It started with a later start than usual flying out at 5pm direct to Newark. The hotel shuttle was late picking us up but the Wife still managed to catch the utter defeat of the Cavaliers. The hotel restaurant provided surprisingly good food to top off our travel day. Day two started with us sleeping in a bit before heading down for a hotel Belgium waffle, biscocho, and orange juice. We took the free hotel shuttle to Newark Penn station (it's confusing that it has the same name as the NY Penn station) and took a train to NY Penn station before hopping on the PATH train to the world trade center. We walked from the station to a store associated with the museum to get directions. There is still a lot of construction in the area and the way to the memorial/museum entrance was not that clear. With directions in hand we head in the right direction, stopping at a burger king for a quick lunch - first BK I've been to where you could have your order taken at your table and they would serve it to you like a 'real' restaurant. I ate more here than the Wife. Our tour time was approaching (our museum tour tickets were time based) so we wandered around the memorial pools quickly before we went to the museum entrance. We had tickets for a guided tour so we took the fast lane into the 911 museum. The museum is mostly underground situated on the bedrock under where the towers once stood. The tour was well done as was the memorial/museum. The tour hit the highlights and introduced you to what the museum offered. After the 1 hour tour we were on our own to explore the details of the memorial. We went through the exhibits quickly as we are not really museum people. I usually only read a smattering of the plaques and information. You could spend all day there reading everything and watching all the videos. The wife and I had different reactions to the museum. She felt it was still a bit to close. It made something so real to us into a museum exhibit. I, on the other hand, am over it. It was interesting and well done but I just want it behind us so we can move on. America is having a hard time moving on. After the museum we went outside to see the pools that now occupy the footprints of the original towers. It was quiet and contemplative. The water pouring in was relaxing. 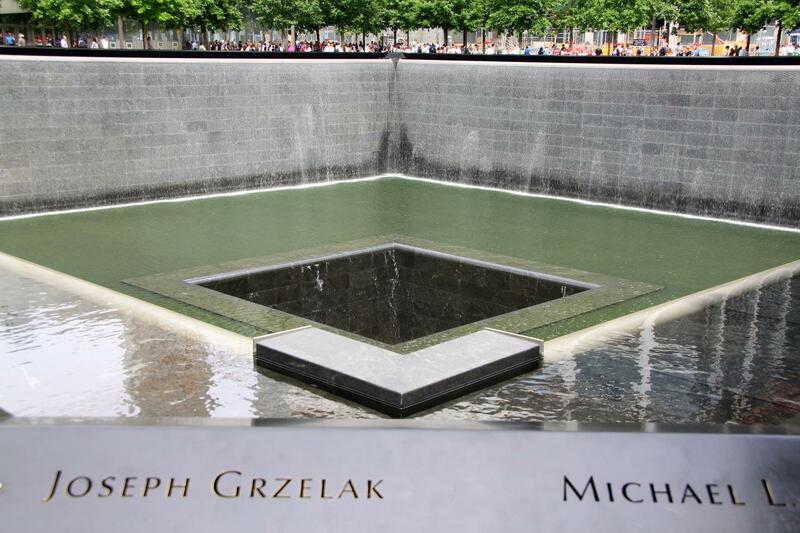 The two pools were lined with plaques engraved with the names of the 911 victims. We sat in the plaza and rested our feet and watched people. I think I heard more 'foreign' languages than English this day - I like that about New York City. Also the city felt more crowded than the last time I was there. I don't remember it feeling so crowded when we visited back in 2005. I wonder if it's because we've moved from California (crowded) to Nebraska (not crowded) since that visit. Or maybe it has to do with getting older. 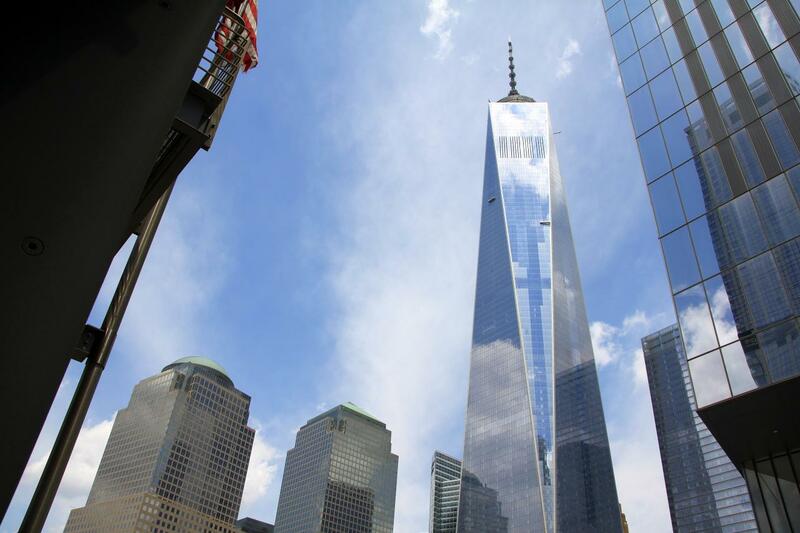 Back into a line to go to the observatory on the top of Freedom tower. Lots of lines involved. There was some confusion with our tickets but New Yorkers are nice and it was cleared up with only a little discomfort. The elevator ride up to the 102 floor is fascinating. The three walls are floor to ceiling video screens. As you climb you see the growth of the skyline. Here is a YouTube video on the way up. On the way down you virtually fly around the tower. Made some people dizzy. Now every elevator ride I've taken seems boring. We would be crossing this bridge soon. 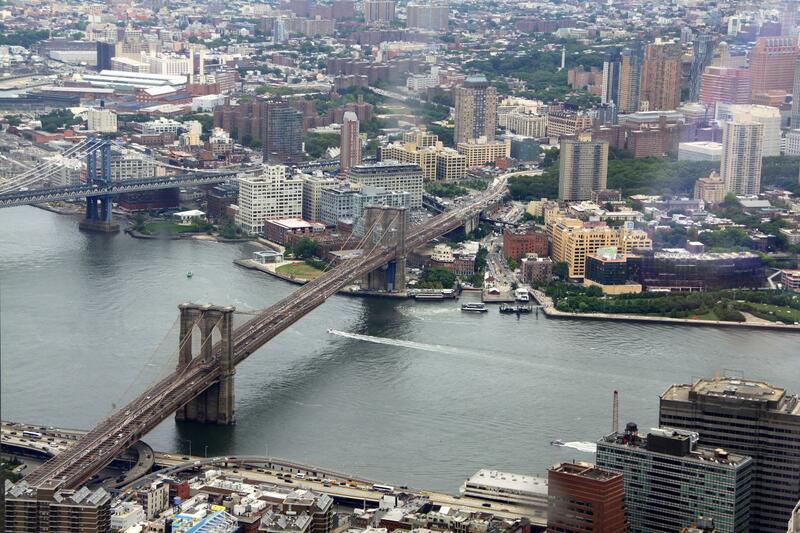 Seen from Freedom Tower Observatory. The weather this day was gorgeous and this gave us great views from the three story observatory. Another line and a quick fly down the elevator and we were back on the ground. We crossed under a street in a very cool tunnel to a ritzy mall so we could get some food for the wife. I had a gourmet cupcake. We both neglected ourselves this day food and water wise. 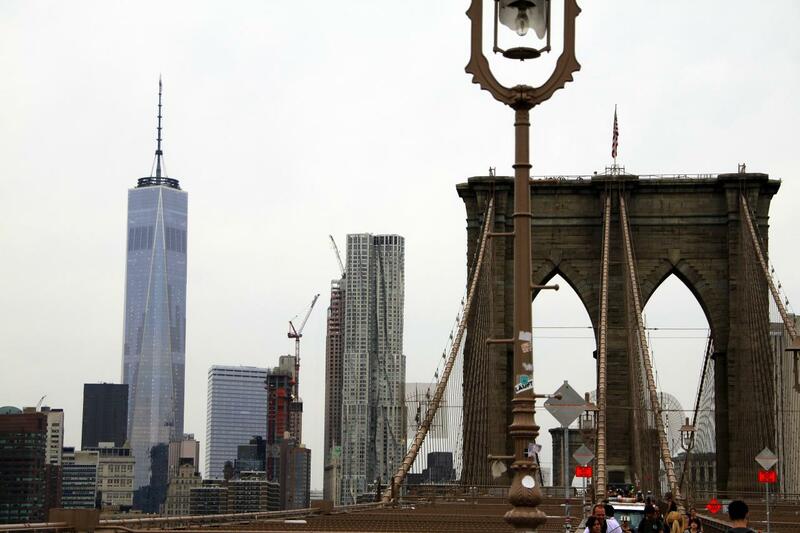 The Freedom Tower from the Brooklyn Bridge. We left the food court and started walking to and over the Brooklyn Bridge. We were meeting an old friend of the wife who she'd known since before she met me. We were worn out by the time we got to the rendezvous point in Brooklyn. The Wife was battling turf toe (from her Football 101 earlier in June) and other foot problems she's been having lately. We met the Wife's friend, LA, and we enjoyed our first real meal in Brooklyn Heights as we chatted. We continued chatting as we walked along the river and saw the lit skyline. The wife's friend helped us get a taxi back to our hotel. This was a bit of an ordeal. The driver didn't know where our hotel was and - shame on us - we didn't have the address of our hotel. The Wife tried to negotiate a fair fare but I didn't help much. I was tired and just wanted to get to the hotel though she did get the price down a bit. The cab got us to the right vicinity and we saw the hotel and pointed it out to the driver. Unfortunately we'd passed the turn. The cabbie then proceeded to back up on the highway. It wasn't very far but it felt like a long way when cars are whizzing by. We made it to the hotel in one piece and several dollars lighter. We celebrated our survival with a really yummy piece of chocolate cake (do you see a trend forming ...?). In our room the Wife took off her shoes and discovered a couple nasty blisters from all the walking today. The shoes she wore which were good for her turf toe were not good for blisters. I didn't have what I needed to treat them properly. We cushioned them the best we could with what we had. Free hotel shuttle to commuter train to Amtrak to Boston - the morning was filled with relaxing train travel. We even sat in the quiet car on Amtrak. Did some reading and typed blog notes. It's nice to have WiFi on the train. We found a lot of free WiFi everywhere in New York. It turns out there would be plenty of free WiFi available on this vacation which makes making plans on the fly much easier. We arrived in Boston and walked to our hotel. The walk was very short - shorter than I expected - a couple blocks. They let us check in early which was convenient. We left the hotel and walked towards Boston Common. On the way we stopped at a tavern and had lunch. I can't say I always ate good on this trip but I will admit that I looked forward to eating at different restaurants every day. I don't think I had a bad meal at any of them. It was all the junk in between meals that was so bad. 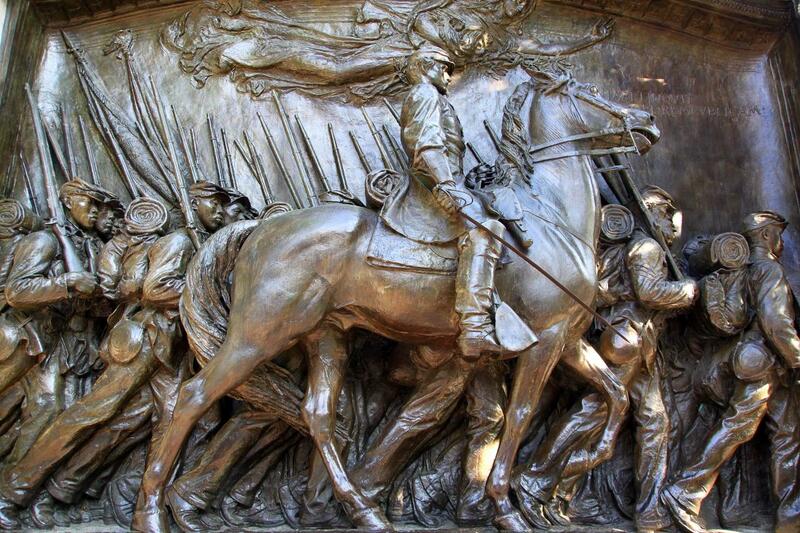 Statue of the Massachusetts 54th. At Boston Common we took a walking tour of the Freedom Trail. The tour was led by a guy in costume. The tour was ninety minutes long. Despite the wonderful weather and easy terrain the Wife and I were exhausted by the end of the tour. We bought something to drink before eating some homemade cookie ice cream sandwiches - awesome stuff. We headed back towards the hotel. Along the way we stopped a few times to rest including once in a nice shaded park with a pond. We bought some drinks and snacks for our room and stopped to see the finish line for the Boston Marathon before calling it a day. In our hotel room we collapsed in bed. This was the second time in two days that we totally wore ourselves out. The Wife's blister got bigger so I used a pair of clippers to cut holes to drain the blisters. That did the trick along with the Wife changing into different shoes for the rest of the trip. Dinner this night was essentially junk food. We were too pooped to go out to eat.